This 13 amp switched socket is of the finest quality as has come to be expected from all Varilight products, they meet all EU & UK safety legislation, Varilight are a british light switch & plug socket manufacturer also known as Doyle & Tratt Limited. The Screwless range is designed to be flatter to the wall than Standard Plate and creates the illusion of having no screws with a dual plate system. Socket Dimensions: 145mm x 85mm. Protrudes 3mm when fitted. Exact Installed depth 22mm (no clearance space), therefore recommended Pattress Box for installation either 35mm or 47mm, UK Standard box. 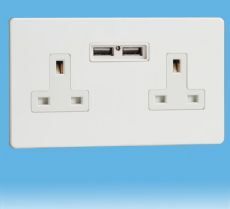 Optimised USB Charging Ports: When viewed from the front, the left-hand USB charging port on this product is optimised for Apple* devices and the right hand USB charging port is optimised for nonApple* devices. Choosing the optimised port may decrease the charging time. *Apple is a trademark of Apple Inc. If you are part of the trade, please feel free to see our trade information page where you may be eligible for trade discount and a dedicated sales manager. Let us know the items you require. We can custom tailor a quote to you!